Geo Compass Pro The best application for localization. Using sensors of your device like the accelerometer and magnetometer the app can calculate the magnetic north with high precision. 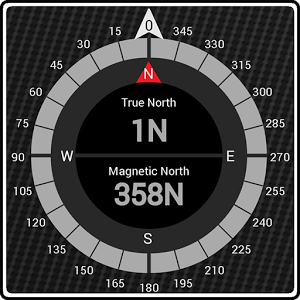 From the magnetic north measurement , and after obtaining the location , it can calculate the true north direction . For devises with GPS, it can display speed and direction of travel. Also allows you sharing your location with friends and family using sms, e-mail or text base application installed on your device. - Display Magnetic North and True North, with cardinal points. - Display image of current Location source (Network or GPS). -You can share your latitude and longitude with text base applications, sms, email, etc.